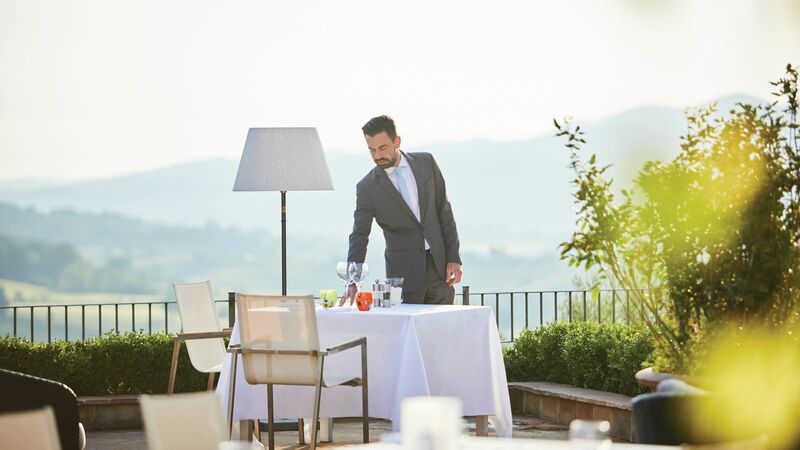 Belmond Castello Di Casole is a luxurious, historic hotel located in the romantic rolling hills of Tuscany. It’s ideal for couples and families wanting to enjoy a tranquil break, with the culture and history of Florence and the area’s smaller towns within easy reach. Spend your days relaxing by the hotel’s infinity pools and soaking in the spectacular views, before trying delicious Tuscan specialities at the hotel’s restaurants and bar. Truffles, vegetables, fruits and wines are all produced on the estate, giving you an authentic taste of the area. Those wanting to relax can head to the spa where there is a range of treatments to try, as well as a steam room. 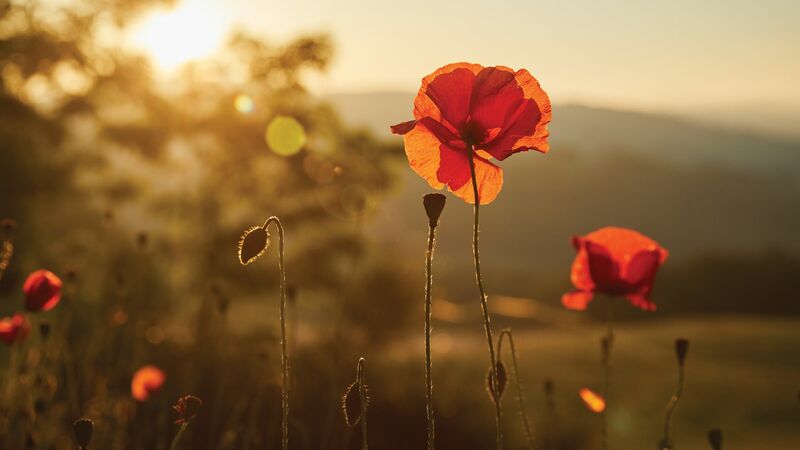 Alternatively, try some of the activities offered by the hotel, including cooking classes, hiking tours, truffle hunting, wine tasting and wine tours. In the evening, head to the bar for cocktails and fine wines or simply relax in your opulent hotel room and enjoy the luxurious surroundings. The hotel has 39 rooms and suites. Child prices apply to guests 0-12 years. Dine in the romantic courtyard or opulent interior as you choose from a wide menu of homemade Italian dishes. Favourites include pasta, seafood, salads and succulent meats. Much of the food, including the olive oil, is produced on the estate, and expert sommeliers recommend fine wines to compliment your meal. Open: 07:00 – 10:30 and 19:00 – 22:30. Choose from traditional Venetian dishes and favourite meals from Tuscany as you take in the views of the hills on the al fresco terrace. Dishes include fresh carpaccio, tagliatelle and delicious seafood options. Open: 18:30 – 22:00 Wednesday to Monday. Named after the family who commissioned the building, this serene bar serves fine wines, cocktails and light dishes throughout the day. Take in the views of the swimming pool and surrounding hills as you relax. Open: 11:00 – 00:00. Lunch 12:00 – 15:00 and dinner 19:00 – 22:00. 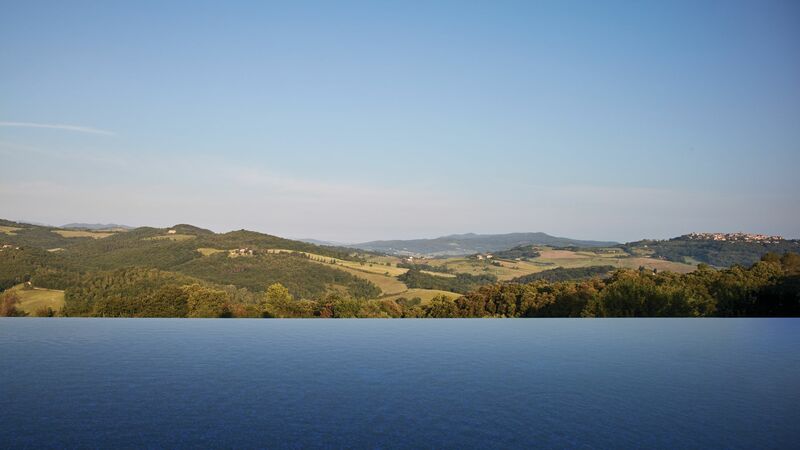 The hotel’s infinity swimming pool is surrounded by a sun terrace with loungers and offers beautiful views of the rolling Tuscan hills. Bar service is available for those wanting to enjoy nibbles and refreshments during the day. There is also an indoor swimming pool at the spa. Children are well catered for at the Belmond Castello di Casole, with family friendly menus, highchairs and babysitting services. 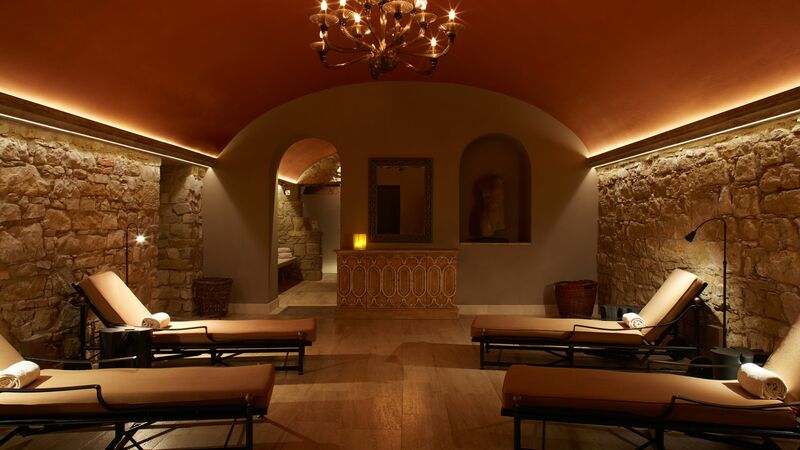 The spa is located in the hotel’s former wine cellar and offers a relaxing, ambient atmosphere. Guests can enjoy views of the Tuscan landscape, as well as seven treatment rooms, a steam room and private outdoor garden. Treatments include facials, massages, body rituals and more. 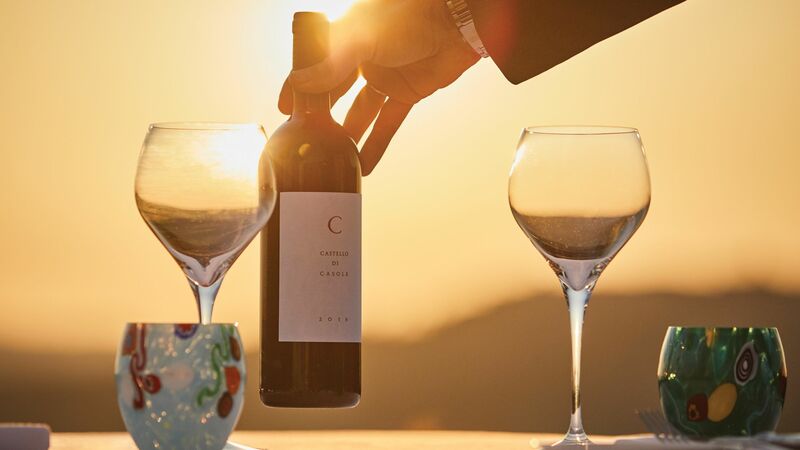 Belmond Castello Di Casole offers guests the chance to explore some spectacular Tuscan wines, as well as witnessing the process in the hotel’s 100 acres of vineyards. 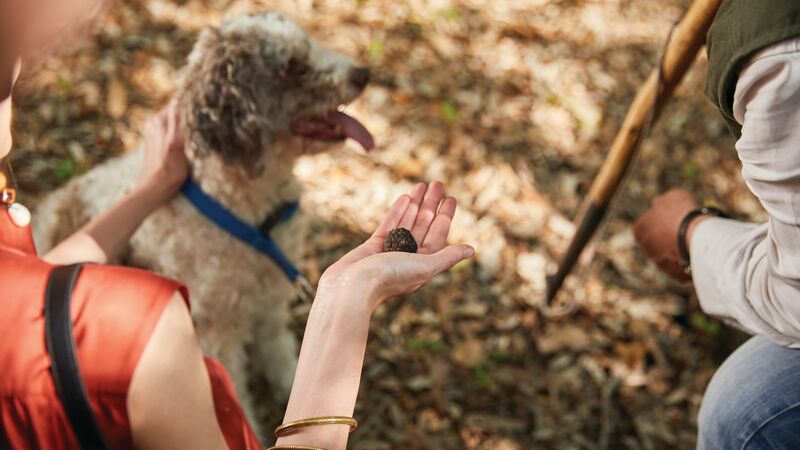 Wander the estate with expert truffle hunters and find these rare delicacies as you go. You’ll learn about how they grow and their uses, before tasting your winnings with a meal at the Bar Visconti. Tuscany is well known for its romantic landscapes, with rolling hills, beautiful meadows and tree lined roads. Guests can explore by bike or on foot, with guided tours available from the hotel. 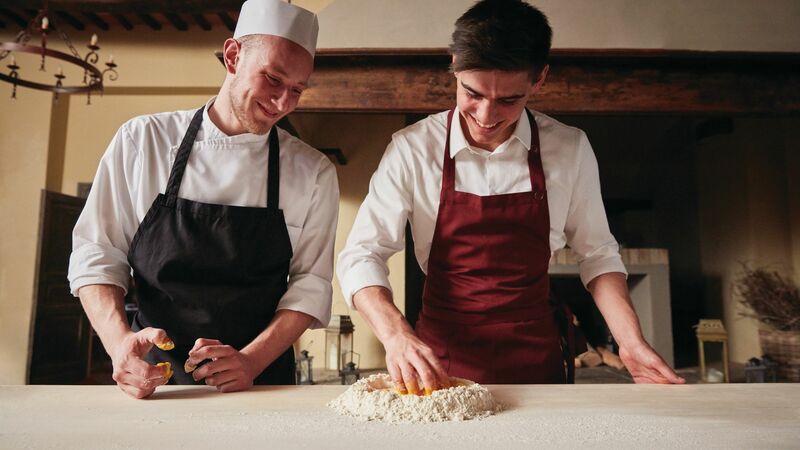 Expert chefs will teach you to cook traditional Italian dishes using fruits and vegetables from the hotel’s gardens, as well as the local farms. 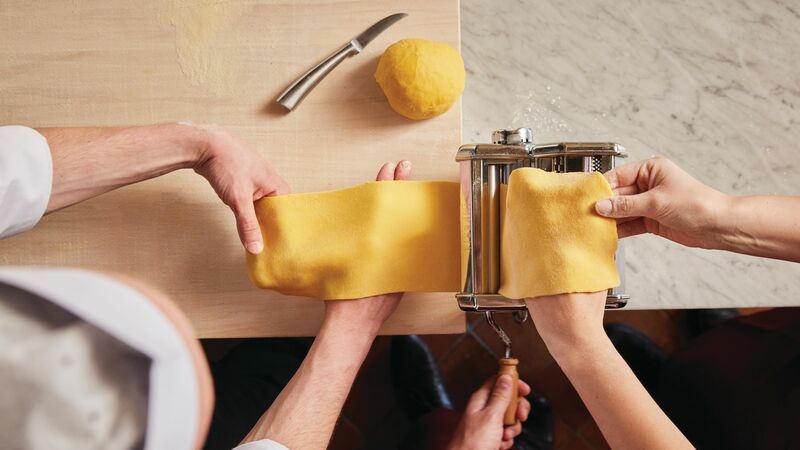 Dishes you can make include tiramisu, fresh pasta and fresh bread. Learn to paint the beautiful landscapes surrounding the hotel, with classes for both adults and children. You can paint in the garden or your hotel room. Please note: Children must be accompanied by at least one adult. Belmond Castello Di Casole is located in the rolling verdant hills of Tuscany, surrounded by beautiful countryside and valleys. Explore the area by bike or on foot and stumble across the picture perfect landscapes the area is known for. Tree lined roads and pretty cottages perched on top of hills, valleys full of meadows and flowers and pretty stone villages are peppered throughout the area. Siena is a 30 minute drive from the hotel, and offers idyllic views and beautiful stone buildings, as well as pretty squares and narrow cobbled streets. Alternatively, Florence is an hour’s drive away and is ideal for those wanting to take in some of the area’s culture. Here you’ll find historic sights, excellent music, theatre, restaurants, bars and plenty more. Belmond Castello Di Casole is an hour’s drive from Florence Airport. Enjoy luxurious décor with rich colours and rustic wooden details. Local Italian fabrics and antiques, and large windows make this the perfect place to relax. Rooms offer king or twin size beds, a writing desk, widescreen TV and a spacious en suite bathroom with mosaic or marble floors. These richly furnished suites are decorated with antique Italian furniture and handcrafted fabrics. Combining luxurious décor with rustic details, guests can enjoy large windows with beautiful views, a king size or twin bed and a comfortable lounge area with a sofa. The en suite bathroom is bright and spacious, with luxury toiletries and a bath and shower. These romantic rooms are lavishly furnished and offer plenty of space. Rich Italian fabrics, local antiques and rustic hues make this the ideal place to relax. There is a separate bedroom with a king size or twin beds, a separate living area with comfortable seating and large windows with views of the gardens or courtyards. Guests can also enjoy a widescreen TV and a spacious en suite with luxury toiletries and mosaic flooring. These regal suites offer plenty of space and elegant décor, perfect for families. Italian antiques and rich fabrics can be found throughout the separate bedroom and living room. Inside you’ll find a king size bed, widescreen TV and large windows with views of the garden or hotel courtyard. The large en suite bathroom has a separate bath and shower, marble flooring and luxury toiletries. Save up to 15% on the hotel price for 2 night breaks booked 45 days or more before departure between 29 March - 16 May, 05 August - 05 September and 14 October - 02 November 2019. Stay for 3 nights and pay for 2 on holidays between 29 March - 16 May, 05 August 05 September and 14 October - 2 November 2019. Please note offers are not combinable. Had an amazing time. 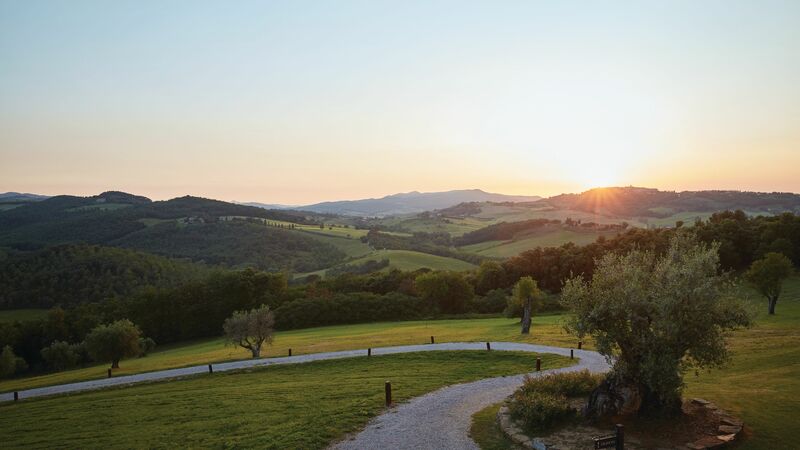 The hotel has possibly the most beautiful setting of all the Belmonds we have stayed in with a wonderful view of the rolling Tuscan countryside and the local town. The room was quite simply amazing, set over two floors it was bigger than our flat at home. We travelled with a two year old who they made feel very welcome and gave us a complementary pizza making class which she loved. On practicalities you have to take a car as lots of wonderful things to see nearby. This hotel was an amazing experience for my whole family. From the moment we walked in we were greeted by warm smiles and almost immediately escorted to the room(after the tour of course). The room itself was comfortable and had the best view of the mountains and hills. If you stay in a villa bare in mind that it is a short walk up a steep hill to get to the main building. The service was okay although it took 45 minutes for a kettle and 10 minutes for a slice of lemon. The food was great but I would recommend staying for lunch and going out for dinner. I also recommend the lasagna at lunch and the pizza. Also this hotel had lots and lots and lots of activities such as painting,cooking,horse riding,safaris,hot air ballooning and i could go on and on. Overall this hotel was a great experience with all the walks,views and well just the whole countryside. I would definitely recommend going to this hotel. 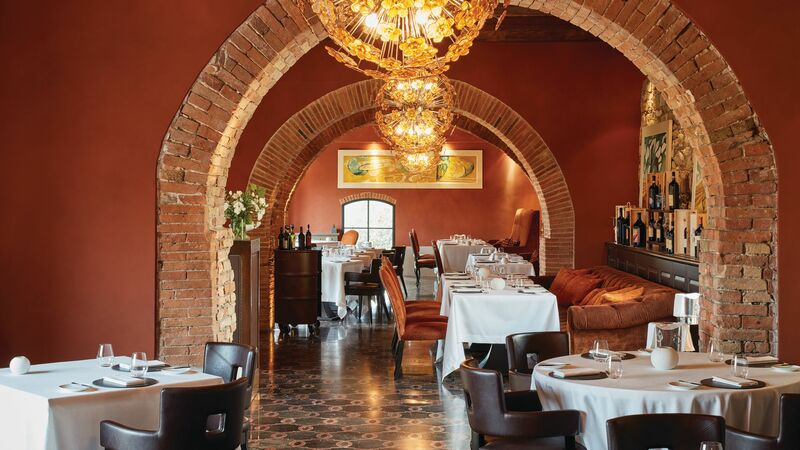 If you are looking for a luxury vacation spot in Western Tuscany, this hotel has it all: a hilltop setting with incredible views, luxurious rooms and common areas, gourmet dining and the best staff in the region. This is truly a castle, with every decoration and attention to detail. The pool, the patios, the gardens and grounds, the bar ??? all top notch. While the prices are high, this is great value for money. The location is great for relaxing and the nearby small towns - C? ?sole D?? ?Elsa and Mensano- are great because they have Tuscan charm without all the tourists. We?? ?ll be back. This hotel is incredible with impeccable service, beautiful decoration, amazing setting and spacious rooms/villas. Unfortunately during our stay we only had rainy/windy days and couldn?? ?t enjoy the pool area but even then our stay was superb. Great service from the start until the day we left. The rooms are very big, spacious and comfortable. The amenities and cleanliness of the rooms are also of high standard. They also offered us a complementary bottle of wine during our stay which was quite nice. This hotel/restaurant is one of the best. 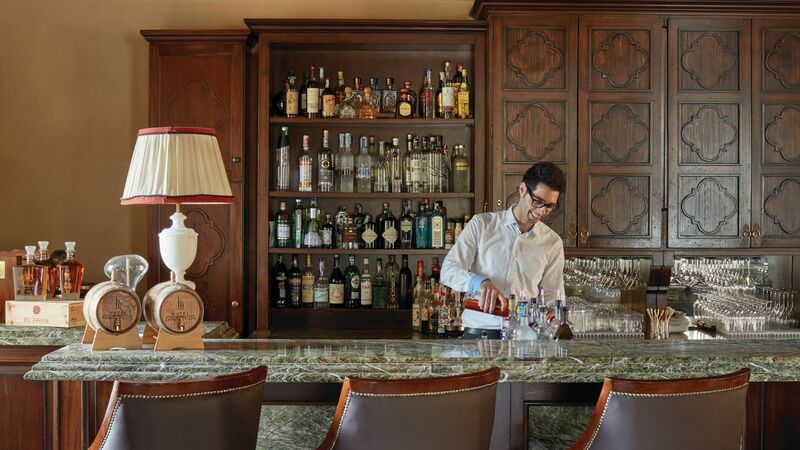 Decor, hospitality, service and ambiance is the defining character of this place and Belmond. Our room was great overlooking the vineyard. The outdoor restayeNt is over the top- taste , originality and service was outstanding. We will be back!! !